If yesterday’s find was relatively rare, today’s is positively rare — a 1973 Chevrolet Chevelle Laguna Estate Wagon. Fewer than 7,500 of them were built, split pretty evenly between two- and three-seat versions. This one was seen in probably the best place for it: outside of a restoration shop — this one being in Wheatfield (yes, the same one as yesterday’s car, but it’s now a couple of years later). 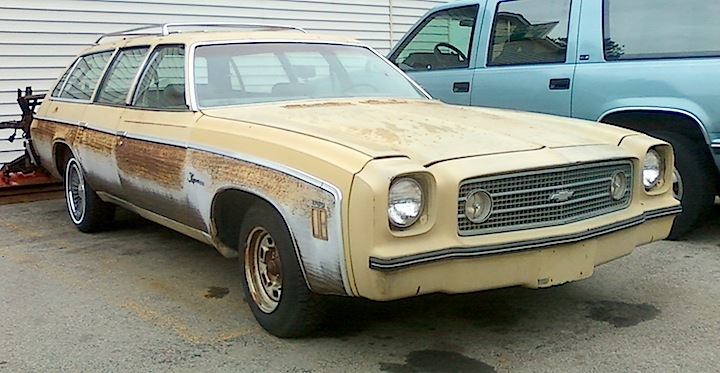 The Laguna Estate wagon had a starting price of $3,795 back in 1973, and was set apart from other Chevelle wagons by what the brochure describes as a “…body-color urethane front bumper protection system,” which, when compared to the other wagons’ chrome-plated five-mph battering rams, looked pretty darned good. — Jim Corbran, RRofWNY The post RealRides Of WNY appeared first on Buffalo Cars.